Cold weather came in fast last winter and stayed too long. What a year 2014 was. It’s that time again to take a stroll back through the past 12 months and recap the highlights of the year. This week we take a look back at the first six months of the year. Enjoy the read. It didn’t take long for cold weather to set in for a very long season. 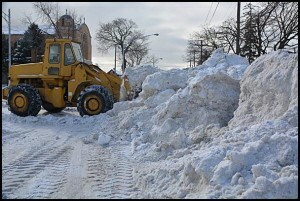 Winter was barely three weeks old when it suddenly came blasting into Hamtramck, as well as almost the entire country. 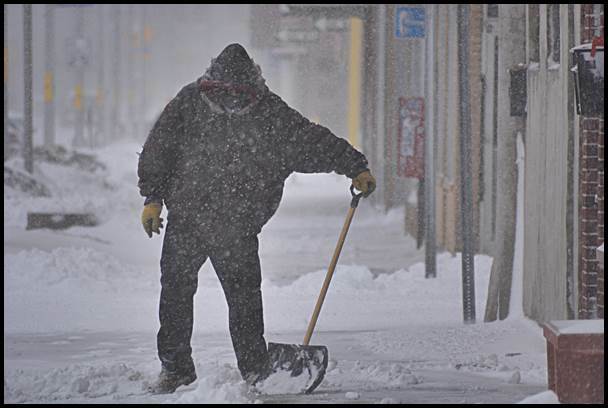 Starting on a Sunday night and going through Monday, almost a foot of snow blanketed the city. On top of that a bitter arctic wind blew in, plummeting temperatures to minus 14 degrees. Add in the wind chill factor and Hamtramckans faced the equivalent of minus-47 degrees, or so local weathercasters said. According to news sources, it’s a super cold air mass which normally hovers over the arctic that gets pulled down by the jet stream, reaching as far south as Atlanta bringing temperatures reached as low as 6 degrees. The dumping of about a foot of snow raised an old debate in town: To plow, or not to plow — side streets that is. On the one hand, it’s argued that if you plow Hamtramck’s narrow one-way streets, you end up clearing the middle lane but burying the parked cars in even more snow. And besides, it’s too expensive to do the whole city. On the other hand, if the city doesn’t plow, no one can get down the side streets. The New Year in Hamtramck started with the usual celebrations and — unique to Hamtramck — the inauguration of newly elected officials. This election year produced a bumper crop of new city councilmembers. Andrea Karpinski, Abu Musa and Titus Walters are all serving their first terms, although Musa is only serving the remainder of former Councilmember Cathy Gordon’s seat. To the freshman city councilmembers, Mayor Karen Majewski said they can expect to be “transformed” by the experience that is about to unfold. An omen of things to come or just a bad start? That seems to be the question in the air after the very first meeting of the city council when it met to select who will fill the role of Mayor Pro Tem. Despite the handshaking and congratulations at the recent inauguration of newly elected officials, those glad tidings seemed to come to a screeching halt during the nomination process. Mayor Karen Majewski refused to break the first four tie votes. “This is an important decision for the council to decide itself,” Majewski said in defense of her refusal to cast a vote. Finally, newly-elected Councilmember Andrea Karpinski received the nod to be the second in charge. For the next two years at least, Hamtramck was set to have peace among its labor unions. All four city employee unions, which includes the police and fire departments and city hall employees, signed new contracts. There are two unions in the Police Department. The biggest changes came in the fire and police departments. Emergency Manager Cathy Square said she came up with $2 million in savings from the two departments. Contrary to what some thought would happen, the Fire Department remained staffed with all full-time employees. It was thought that Square would reduce the number of full-timers and fill out the rest of the department with part-timers or combine the fire and police departments into a public safety unit. Square said she wasn’t brought on board to make such a huge change. In 2012 The Review published a portion of billings from the city’s largest contractors, except one: City Attorney James Allen. At the time, Allen denied a Freedom of Information Act request from The Review for a copy of his billings to the city. He denied the request on the basis that releasing the information would violate the attorney-client privilege. “Each of the invoices contains information that pertains to confidential communications that the City Attorney and members of his staff have with city officials in the performance of their official duties,” Allen said in his letter denying the request. 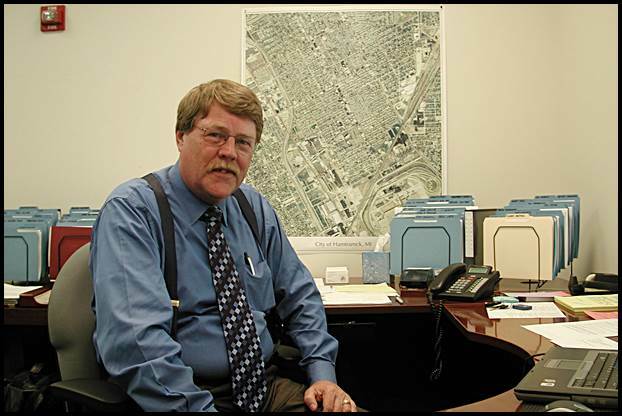 Allen’s tenure as city attorney came to an abrupt halt when Emergency Manager Cathy Square took control of the city on July 1. 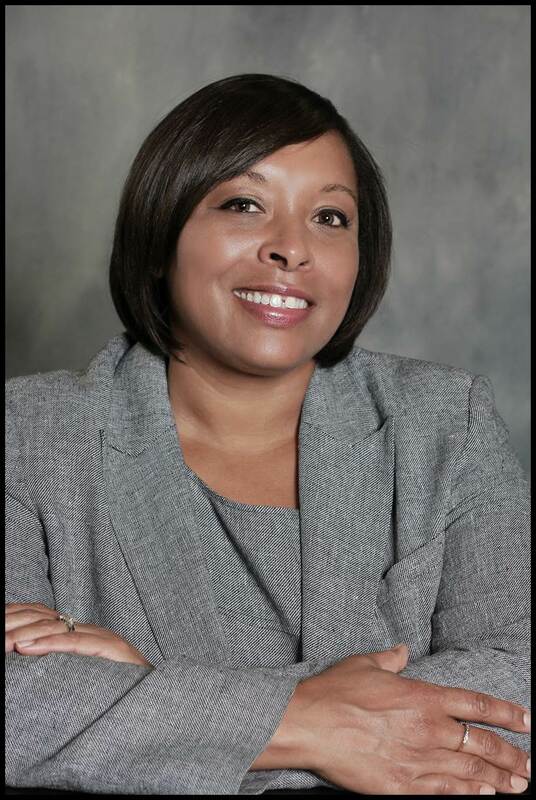 One of her first actions was firing Allen’s law firm and hiring a new city attorney. 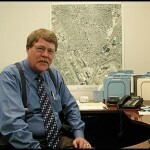 The Review submitted another FOIA request in December, and this time Allen’s billings for 2011 and 2012 were released. However, Allen was allowed to black out, or redact, billings that he said were protected information. Over 1,000 pages of billings were given to The Review, weighing nearly 13 pounds in total. A number of line items were indeed blacked out, but the vast majority of the billings were untouched. No task was too small to bill. Read and answer an email? He billed the city $30 for that in one instance. Attend a four-hour council meeting? That cost nearly $600. Much of the billings were to justify the city’s retainer fee of $6,500 a month. But there was plenty of work done outside the duties of the retainer, which ended up costing over $300,000 a year. Some of the billings appeared to deal with issues not directly involving Hamtramck, such as one for Nov. 10, 2011 in which one of the attorneys in Allen’s law firm spent time on “extensive research” on the resignation of State Rep. Tim Melton and how it was “accepted” by the House of Representatives. Melton was a Democratic lawmaker from Auburn Hills who resigned to take a job in California. That research cost the city $107.96. A Hamtramck High School student had some serious bragging rights. And possibly has a budding career. Mujo Hrnjica, 17, a sophomore at Hamtramck High School, won a high school poster contest sponsored by the North American International Auto Show (NAIAS). Hrnjica was the second place winner in the 10th grade category. He received a cash prize of $250 and a framed certificate. The 26th Annual High School Poster Contest was open to Michigan students in 10th through 12th grades. Among the 989 entries from 73 high schools, a total of 16 awards were distributed. As an art enthusiast, Hrnjica said he was eager to take the opportunity to enter the contest. He added that he was excited when he realized he was one of the winners. It had been six months since the Al Islah Mosque was given the go-ahead to fix up their new location at the northeast corner of Jos. Campau and Caniff. And it appeared the mosque was ready to start that project. The mosque had recently pulled a permit to begin redesigning the outside of the two-story building. The mosque’s design was initially rejected by the city’s Plan Commission because it did not conform to city code. The design initially would have blocked most of the windows on the building. The city’s design code says that at least 70 percent of a commercial building’s façade has to be open window. The new design will have a Middle-Eastern motif that includes minarets on top of the building. It’s estimated that the work will cost about $275,000. Update: Work on the mosque has yet to begin. Hamtramck’s Concerned Women of Hamtramck once again hosted a stirring breakfast celebrating the life and times of Martin Luther King, Jr. This year they upped the celebration, attended by city and school officials as well as students, by also featuring a special presentation on Nelson Mandela, the former President of South Africa who had just died several weeks prior. 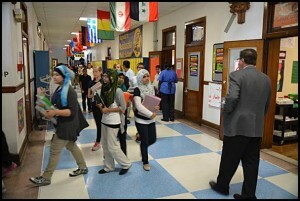 Hamtramck Public Schools were doing much better than thought. 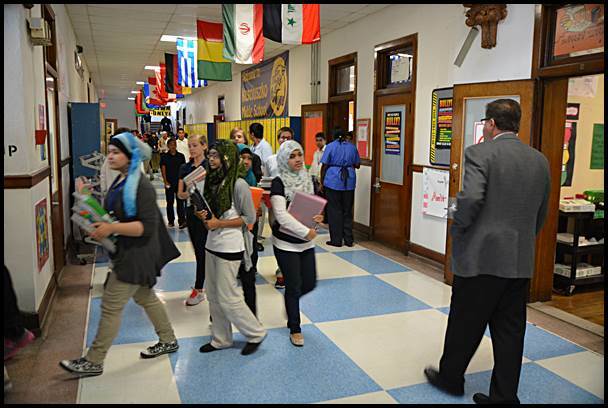 For the second year in a row, Hamtramck’s public school district proved to be doing better than what the Michigan Department of Education said. According to the MDE, the school district is lingering under the 10th percentile compared to other districts. Some 84 percent of the district’s students get free or partially subsidized lunches. There were 2,897 students in the district. A Hamtramck family who were using space heaters for their only heat source learned a hard lesson. And got a lucky break. Hamtramck Fire Chief Paul Wilk said a fire broke out around 9:30 a.m. in a two-family house on Trowbridge St. most likely due to an overloaded electrical system. The family’s furnace had not been working for a couple of days and while they waited for it to be repaired they plugged in several space heaters. “Space heaters are not the answer,” Wilk said. One of the space heaters burst into flames in the porch stairwell next to the upper floor apartment. Wilk said there were also no batteries in smoke detectors throughout the house. It’s likely, Wilk said, that family members were woken up by smoke. A neighbor across the street put up a ladder before firefighters arrived so those in the upper flat could escape. In a special meeting the School Board reconsidered a prior vote to contract out the 18 jobs of custodians. With the recent outsourcing of security, bus drivers and custodians, Niczay said the resulting savings will be $600,000. He still had a way to go to reduce a $3.7 million budget deficit. The year 2014 marked the Hamtramck Fire Department’s 100th anniversary of serving the city’s residents. Founded on Nov. 16, 1914, the fire department made it their mission “to protect the lives and property of the citizens,” according to their website. Prior to 1914, a group of firefighters organized themselves into a company called Spouters No. Eleven in order to protect the city of Hamtramck. For over 40 years Rev. 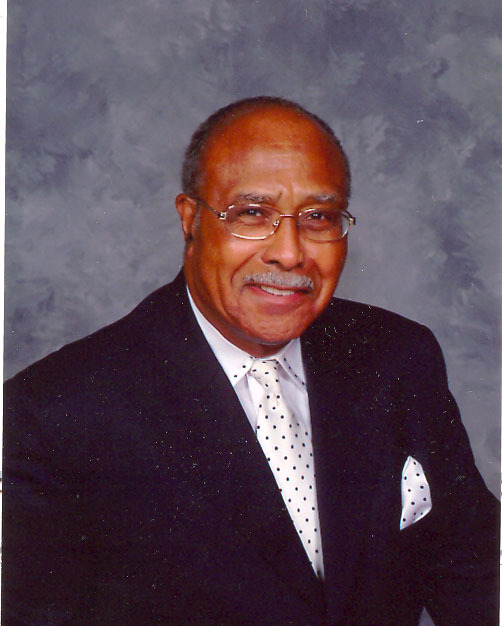 Joseph Jordon oversaw his congregation at Corinthian Baptist Church. He was known as a caring and fatherly figure in his church, located on Caniff just west of I-75. Rev. Jordon, 77, died suddenly in February, a day after delivering his last sermon, asking his congregation to consider the importance of faith and how faith has entered their lives. Titus Walters, a deacon at the church and also a member of Hamtramck’s City Council and School Board, credited Jordan for his journey into faith. 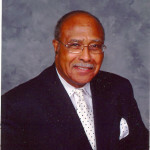 Jordan served as past president of the politically influential Detroit Council of Baptist Pastors. His service to the community was acknowledged by the Hamtramck City Council, which renamed a portion of Caniff, in front of the church, in honor of Jordan. Six months down, six months to go. Hamtramck Emergency Manager Cathy Square had just finished up the first half of her employment contract with the state, and she was looking ahead at her last six months. 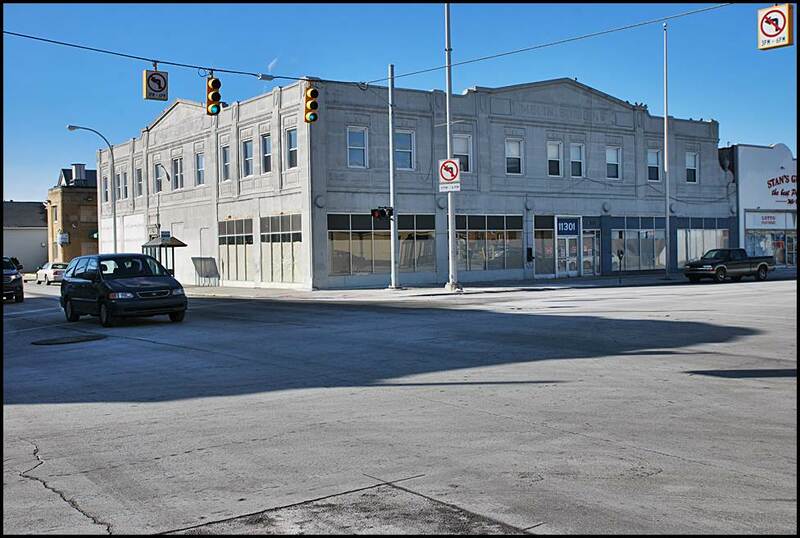 Square started work here on July 1, freshly after being appointed by the state to fix Hamtramck’s financial crisis. Her first job, she said, was to negotiate new labor contracts with the city’s four employee unions. She delivered those contracts in December. They included salary and benefit concessions that are a milestone in the city’s history of labor negotiations. The second half of her year-long contract was going to focus on less attention-getting issues. Square also began looking for a city manager to hire as well as a new assessor and treasurer. There were some internal financial controls that Square said had been lacking, which led to some of the reasons the city had previously run into financial trouble. “I’m here to identify where we dropped the ball in the past,” Square said. Some of those deficiencies were addressed in a recent internal audit that had been performed. Square’s contract was scheduled to run out at the end of June. But as it turned out, she stayed until mid-December. There were few surprises in the audit of the city’s financial situation for the year that led up to an appointment of an emergency manager to take over. Auditors from Alan C. Young & Associates presented their findings of the city’s fiscal year for 2013, which technically ended June 30. A key problem, which was noted in the audit, was that the city was spending more money than it was taking in. That alone was against state law. On top of that, the city failed to make a $2.3 million pension payment. The audit did not reflect on what had happened after Emergency Manager Cathy Square came to town on July 1. Square said that in the past few months she took care of most of the deficiencies outlined in the report. A sigh of relief could be heard around town during the second week of February. That was when tractor trucks hit the city streets to clear every street of snow — at least down the middle lane. Almost two feet in snow had pelted the metro area. “We were caught unprepared by not having a plan,” said Emergency Manager Cathy Square in reference to why the city waited weeks to plow the streets after the first big snowstorm. Square said at the time of the first heavy snowfall she was surprised to learn the city did not have a snow emergency plan in place. She created a special panel of department heads, including the fire and police chiefs, to come up with a plan. In the meantime, Square ordered the city’s snow removal contractor to clear the streets. The cost would be about $24,000, Square said, and would come out of a state road maintenance fund the city receives annually. The relationship between city officials and Emergency Manager Cathy Square continued to be strained. Hamtramck’s City Council wanted some answers from the emergency manager and department heads. “We don’t know what’s going on because nobody’s telling us what’s going on,” said Councilmember Robert Zwolak. Zwolak’s colleagues agreed and sent a request to Square to allow department heads to give updates and also for Square to make a report. Not going to happen, Square told The Review. Councilmembers further complained that financial decisions and labor contracts are being made without their knowledge or input. Square said the council won’t have to worry about making financial decisions after she leaves because they won’t be empowered to do so. Instead, she said, she will have a two-year budget in place, and the state will have a transition board in place to oversee the financial decisions a city manager will be making. Square said this should come as no surprise to the council because local officials were to blame for allowing Hamtramck to fall into a financial crisis for a second time in 10 years. “They didn’t know what they were doing when they were running the city,” Square said. 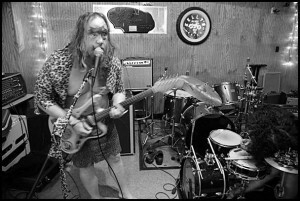 Local musicians created their own music festival in answer to the Metro Times Blowout expanding to include Ferndale. Apparently a number of music lovers missed slogging around town during the first weekend of March to catch hundreds of local bands playing in local bars and halls? A group of Hamtramck-based music lovers decided that if the Metro Times no longer wanted to hold its annual Blowout during that weekend, heck they’ll put together their own independent festival. Last year The Metro Times moved its Blowout to the first weekend of April and also expanded it to Ferndale. In response, organizers behind the newly coined Hamtramck Music Festival are reclaiming that first weekend of March. According to its Facebook page, it’s all about a love for Hamtramck and music. By the looks of things, it was going to be a huge weekend. There were already 160 bands on board and 15 venues participating. The festival was set for March 7 and 8. Someone forgot to tell Hamtramck bars that a new state law prohibits smoking. It was said back in the days of Prohibition that someone forgot to tell Hamtramck that you couldn’t sell or consume alcohol anymore. Those were the wild 1920s when Hamtramck bars operated openly and freely while other cities enforced Prohibition. Flash forward to February during a ban on smoking in bars and it seems a handful of local bars are flouting the law and allowing employees and patrons to smoke. During the past week, police officers have been hand-delivering a message from the chief, reminding the bars that smoking inside isn’t allowed. Chief Max Garbarino said there were complaints filed with the state recently about people smoking in bars. Hamtramck’s Director of Public Works says he was falsely accused of a hit-and-run accident in a lawsuit he filed against the city. In his suit, filed in Wayne County Circuit Court, Steve Shaya says two Hamtramck police officers retaliated against him when he exposed one officer’s improper private deal with the city to provide tow truck service and also the fact that he worked at a local garage which had a contract with the city to provide repairs to police cars and install special lights. Shaya is seeking an unspecified amount in damages. City Manager Square said she could not comment on the lawsuit and had not yet reviewed it with the city attorney. The board also heard from parents and secretaries who gave impassioned pleas to save their jobs. On May 6, Hamtramck voters will be asked to OK a school tax millage that will go toward fixing up school buildings. The 4-mill tax would be on the tax rolls for 10 years and produce about $700,000 a year for a total of about $7 million by the end of its life. Several months ago the district hired an engineering firm to do an exhaustive study of the district’s buildings and found a long list of needed repairs. Those repairs include new windows, roofs, doors and heating and cooling units, among many other needs. “Our needs are far more expensive that what the school district can provide,” said Schools Superintendent Tom Niczay. Winter’s deep freeze affected the city in many ways, including delaying an upgrade of Jos. Campau streetlights. Work was supposed to begin a month earlier swapping out the old lighting system and installing energy-efficient LED lights. But the lingering cold snap prevented work crews from digging to install new wiring. The new wiring system will prevent all lights from going out when a single light goes out. Who’s to blame for the city’s money woes? Hamtramck would be looking at a nearly $9 million budget surplus today instead of a budget deficit if it hadn’t been for a steady progression of state cuts. That’s what Anthony Minghine, the Associate Director of the Michigan Municipal League, says in a recent column he wrote for the League’s magazine. Minghine minced no words in how Michigan’s past and present officials have handled the state’s financial crisis. The solution to fixing the state’s budget woes, Minghine said, came on the backs of communities by slashing millions of dollars in state revenue sharing. “This would be like me taking your money to pay my bills, and then telling you that you need to be more responsible with your household budget,” Minghine said in reference to the state’s steady cuts in revenue sharing to communities. While the state was at this time enjoying a billion dollar surplus, many communities were teetering on the edge of financial collapse. Several months ago, Hamtramck couldn’t hold out any longer and was among a handful of cities that were taken over by a state-appointed emergency manager. Hamtramck honored two people for saving others from danger. Ryszard Pasienski, a resident of Sterling Heights, was visiting his sister who lives on Trowbridge St. when all of a sudden he heard someone screaming outside. Pasienski said he ran to his truck and pulled out a ladder and helped the three escape. There will be a new look to Pope Park. A major makeover was in the works for Pope Park, the first since the monument was installed in 1982. The Karol Josef Wojtyla Committee presented its plans for renovation of the park to the city council and received their support. 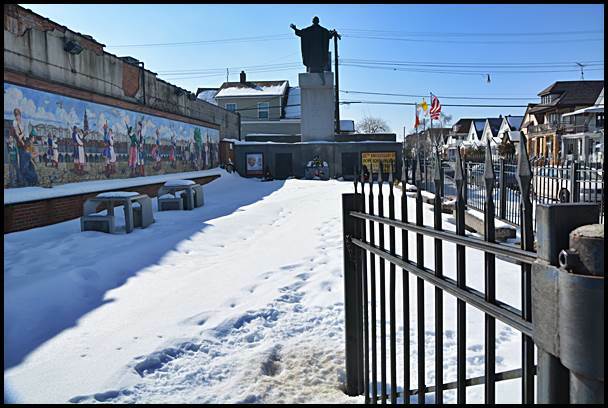 The committee, named after the late Pope John Paul II’s birth name, will remove the iron gating around the park and bring in landscaping. Committee member Tom Jankowski, who was a former mayor of Hamtramck as well as a recent city councilmember, said it will cost about $50,000 to make immediate repairs and improvements. The committee is on its way to becoming a 501 (c) non-profit that can accept donations directly. As of December, the committee is still seeking donations to fund the project. Despite freezing temps and a biting wind, thousands and thousands of visitors stood outside in lines on Paczki Day just to get their hands on a box of paczki. You could say they were either committed or crazy. No matter what, Paczki Day in Hamtramck was another rip-roaring success for the bakeries. 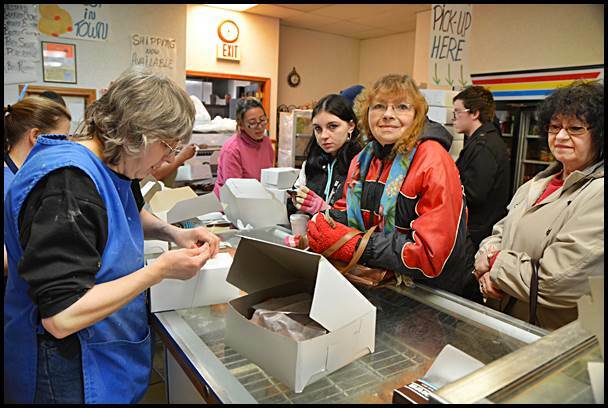 No one could guess how many dozens of paczki were sold, but one thing was for sure: Lines of paczki lovers lasted from early, early morning right through the evening. And, as usual, the day was a huge boost to local bars, some of which featured bands all day and night long. For several weeks city officials ramped up their plea for some attention from the emergency manager. Mayor Karen Majewski and city councilmembers had complained that Emergency Manager Cathy Square was not sharing financial information with them and rebuffed their requests to meet with them. Square had countered, saying that she’s playing it by the rules, and the rules governing emergency managers don’t require her to meet with city officials. But Square said she was not entirely deaf to their requests. Call it an olive branch of sorts. Square said she would get the Michigan Municipal League to tutor city officials on how to deal with financial matters and would allow the council to weigh in on the hiring of a city manager. As for financial documents, Square said anyone could see what she was doing by going to the city’s website as well as through the state’s website. The first-ever Hamtramck Music Festival brought out thousands of people to Hamtramck in the first weekend of March. The weather went from decent to bitter cold. Despite the weather, the attendance went from decent to packed as the weekend carried on. Sources from The Hamtramck Music Festival Committee, the group that organized the event, said that approximately 2,500 people from across the metropolitan area came together to listen to 133 local bands at 16 different venues. First came a really cold and snowy winter, and then came the potholes. Been doing the Danforth dodge? No, we were not talking about new dance moves. We were talking about trying to avoid hitting the numerous potholes on every freakin’ street in the city. And also on the streets beyond Hamtramck’s borders. Winter’s extreme cold created not only more potholes, but monster-sized ones at that. 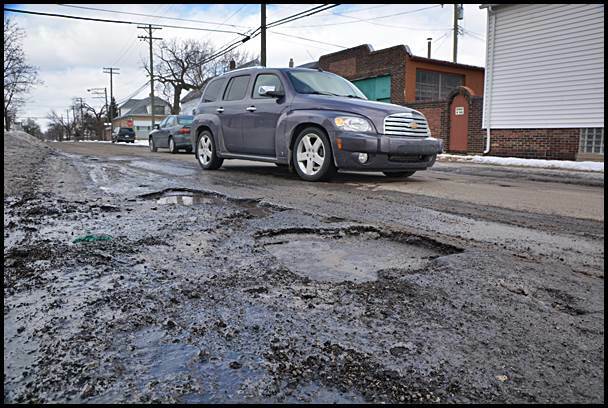 “Hamtown has, hands down, the biggest, widest and deepest potholes anywhere I’ve been,” said Nolan Skipper LaFramboise II, a former business owner here and still a frequent visitor to the city, in a posting on his Facebook page. “Basketballs and tires, with the wheels attached, could disappear in yours,” he added. The city began filling the most severe potholes when it could, and when weather permitted. But with the constant swings between cold and warmer weather, it was hard to keep up, said Steve Shaya, Director of Public Works. “It’s just been a horrible winter,” Shaya said. Hamtramck Public School supporters ramped up their campaign to get a special millage passed. On May 6, Hamtramck voters were going to be asked to vote on a “Capital Improvement Sinking Fund Millage” that would raise money to improve and preserve public school buildings. Supporters said it was a “pay-as-you-go” method that was an alternative to the district borrowing money and paying interest on top of it. The millage would allow the district to improve buildings without taking money away from the students’ education. The estimated cost to the average Hamtramck household, based on a taxable value of $18,000, was $72 per year. In return homeowners were promised a better education environment for students and school improvements translating to an increase in property values. The argument went that because the improvements would make living in Hamtramck more desirable, house values would rise. Voters did approve the millage, but by a slim majority. What was on the mind of residents as winter continued to punish us? That was the ongoing theme of concerns residents talked about at a Town Hall meeting, sponsored by the Hamtramck Community Initiative. Peggy Maley of Prescott St. got the snowball rolling, so to speak, when she asked about the “900-pound elephant in the room” that no one had previously addressed during the meeting. Several other residents chimed in with the same sentiment, leaving the big question of the night, “what is the city going to do?” largely unanswered. To her credit, Kathy Angerer, the Director of Community & Economic Development, tried to form an answer that would bring a closure. She said the city administration was aware of the problem, and promised that by before next winter, there will be a plan in place. Hamtramck police officers said they were going to think outside of the patrol car once warmer weather settled in. Police Chief Max Garbarino said the department purchased two Trek bikes that were specially equipped for officers, thanks to the department’s narcotic forfeiture fund. He said police and reserve officers would use the bikes as a way to add a unique patrol to the city. A mighty wind blew through Hamtramck. And it stirred up a concern over what residents were breathing in. That was what Alan Shulgon said about the dust clouds being whipped up by the wind at the American Axle demolition site. Shulgon, a retired Hamtramck detective and a School Boardmember, was not exaggerating. At the demolition site huge dust clouds were being kicked up, spreading into the neighborhoods. Christine Komisarz was out walking her dogs during the dust storm, and although her dogs seemed oblivious, her eyes filled up with grit. 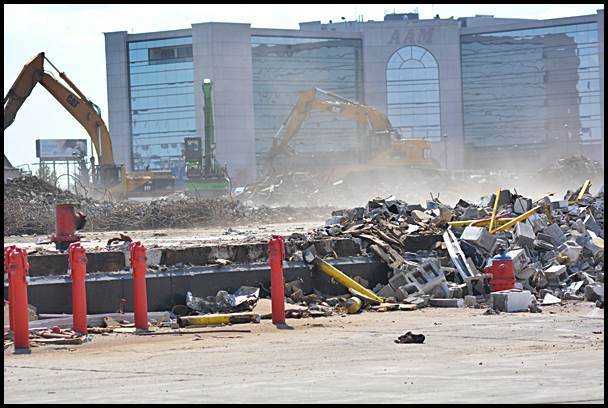 American Axle began tearing down its plants a few months prior in an effort to market the site to a developer. A California company had purchased 72 acres out of 111 acres that were being cleared. Concern over what was in the dust reached the Detroit branch of the state Department of Environmental Quality, which confirmed that several calls about the dust had been received. A spokesman for American Axle told The Review that “there’s nothing harmful or toxic” in the dust. 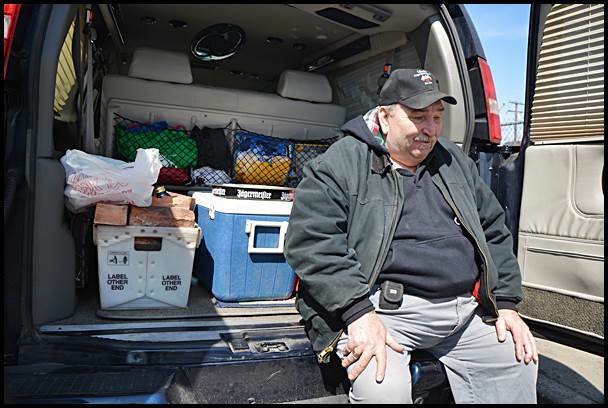 On a day that Tigers fans celebrated opening day, John “Hippo” Hypnarowicz and friends were holding their own tailgate party in Hamtramck. Except it had nothing to do with baseball. Instead, Hypnarowicz, who everyone calls Hippo, and friends showed up early one morning to share drinks and watch the demolition of Hippo’s Bar on Conant. “The Tigers had opening day, we had closing day,” cracked Hippo. You could call it a case of gallows humor. The bar burned beyond repair several months prior, no thanks to a faulty transformer hanging from a pole next to the bar’s garage. 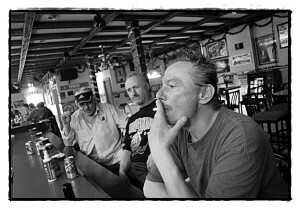 The bar had been in business for over 30 years, Hippo said. For the last 24 years he and his wife, Mary, owned it. 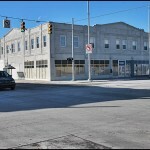 It was another classic building, built in the 1920s or earlier, that spoke of a time when Hamtramck was a bustling city. Hippo’s, though, increasingly became a place out of time. Conant is now the nerve center for Hamtramck’s thriving Bangladeshi business community. Most Bengalis are Muslim and don’t drink alcohol. Hippo’s crowd dwindled over the years as the city’s Polish-Americans moved north to the suburbs. The bar once pumped with the energy of young adults. It was small by Hamtramck standards, with enough space for maybe 50 people, and that would be shoulder-to-shoulder. And so, another one of Hamtramck’s neighborhood bars came to an inglorious end. Not only was this winter brutally cold, it was expensive. For the City of Hamtramck, it was very costly. During the months of December through March, the city spent over $483,000 to clear snow and salt about a dozen city streets. That expense was included in a three-month financial report submitted by Emergency Manager Cathy Square. 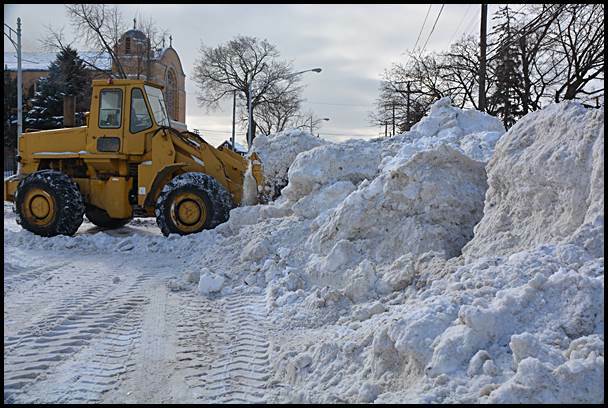 Mayor Karen Majewski wasted no time in posting on her Facebook page what the city paid its contractor, Platinum Landscaping, Inc., to plow and salt the city’s emergency routes, as well as city parking lots, Jos. Campau’s sidewalks and cold patching potholes. There was also one instance of a citywide snow removal after side streets became almost impassable. Majewski told The Review that despite the severity of last winter, she thought the cost was suspicious. 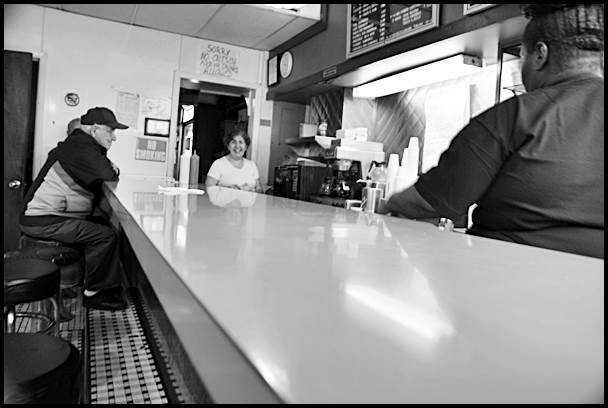 For over 36 years Stan Nalepa taught in the Hamtramck Public School District. For most of those years he taught 8th grade social studies and language arts. Over 300 out of the thousands of students he had in all those years “friended” him on Facebook. Now he had a special favor to ask. Nalepa, 65, needed a kidney. He had been going through dialysis for over a year, three times a week, for three-and-a-half hours each sitting. If you have ever seen anyone go through the treatment, it’s not a pretty picture. “I can’t stand it anymore,” Nalepa said. A transplant would give Nalepa a second lease on life, and would allow him to live a normal length of time. City officials got a chance to weigh in on who should be the next city manager. But instead of focusing on the two candidates for the job, they set their sights on Emergency Manager Cathy Square. City Councilmember Anam Miah complained that Square did not release the candidates’ resumes until right before the council’s meeting with the two candidates. “This was a show and tell,” he said. Mayor Karen Majewski complained that Square had not prepared the council on what role the council will play – if any – in selecting a city manager. “We’ve heard nothing,” she said. The council did go on and interview the candidates, but as it turned out, neither were hired by Square. Hamtramck and Wayne County voters were going to see a familiar name in the August Primary Election. Christopher Wojtowicz, the son of Wayne County Treasurer Raymond Wojtowicz, was one of several Democratic Party candidates running for the office of Wayne County Executive. Wayne County Executive Robert Ficano had come under increasing criticism of his management, especially the handling and then abandonment of a new county jail downtown. Plus, there had been investigations and convictions of county administration officials for corruption. Political observers predicted Ficano would face a stiff challenge for re-election. They were right. He lost, but Wojtowicz didn’t even come close. The election season came a little early this year in Hamtramck. The public school district started a campaign asking voters to approve a 4-mill tax proposal on May 6. The ballot proposal was the only item on the ballot. Hamtramck Public Schools was one of a half dozen school districts in the metro area seeking a special millage. The millage came about as an increasing number of school districts struggled to balance their budgets in the wake of state financial aid being slashed under Gov. Rick Snyder. Hamtramck’s millage was earmarked toward school building repairs, and could not be used for anything else. The district has an exhaustive list of repairs that are needed. Millage supporters have been going door-to-door to inform the community about the proposal. Voters had been up and down in supporting past millage proposals, but they did support it. The tax will add on about $70 a year for the average Hamtramck homeowner. But considering that house values had decreased in recent years, the annual tax payment has gone down for most. 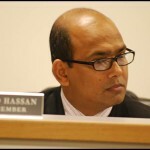 City Councilmember Mohammed Hassan’s campaign to become a State Representative ran into trouble. 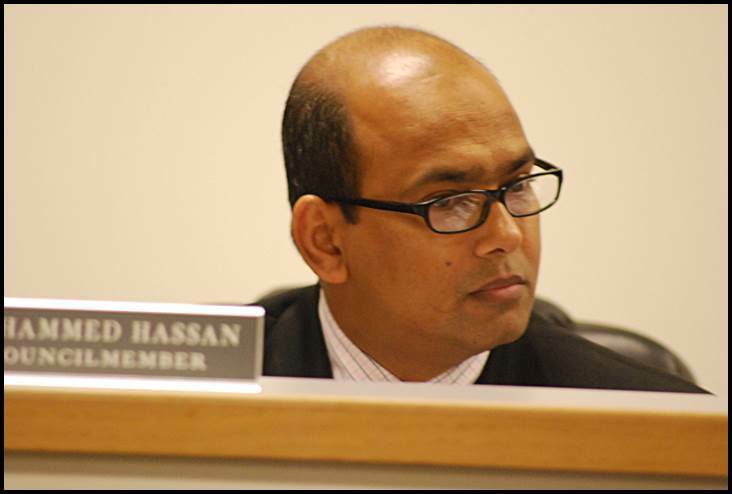 According to campaign records from the Wayne County Elections Division, Hassan owed the county $3,000 in fines and fees from his run for the seat in 2012. According to an affidavit he submitted on April 22 to enter the race, Hassan signed off from owing any fees or fines. That was not true. He faced possible perjury charges and had he been convicted he could have been fined $1,000 and imprisoned for five years. Hassan later begged the Secretary of State Office to dismiss the debt, saying he was broke and did not know the law. The SOS office rejected his request, and Hassan later paid up. This wasn’t the first time that Hassan’s debts raised questions. Several months ago, his status as a councilmember came into question when it came to light that he fell behind on paying his water bills. According to the city, Hassan owed $758. He entered a payment plan, but failed to live up to that agreement. The city eventually turned off his water service. According to the city charter, any elected official who is in default to the city or any other government agency can be kicked out of office. There’s been one constant in Hamtramck School Boardmember Yvonne Myrick’s long life. 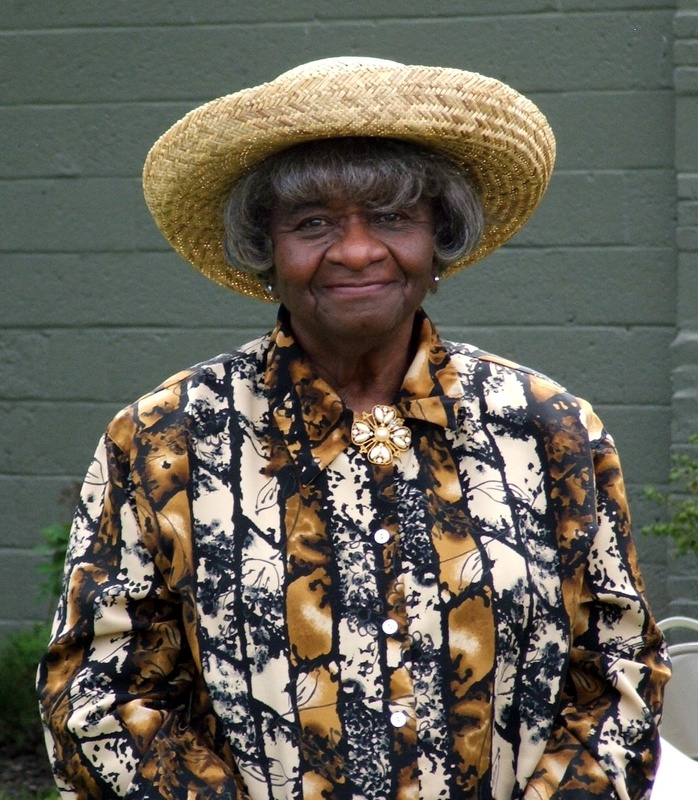 Myrick celebrated her 90th birthday on May 3, and had said she would not seek re-election. She ran for election 10 times before she succeeded. She had been in office since 2001. But she was hardly out of the woods. She credited her full recovery to God. After 30 years in business, it was last order up at Campau Tower. The landmark hamburger joint served up its final burger in early May. Nick Konke had the distinction of being the last customer. Konke had been hosting a yard sale that day and heard from people stopping by that there was a sign in the window of the business saying it was closing that day. He heard about it a little late, and just a few seconds after owner Sandy Bakic shut off the grill. Konke came in, asking – begging – for one more for the road. Bakic’s family had owned Campau Tower for 30 years. The restaurant didn’t stay closed for long, however. A new owner took over and gave it a hipster makeover but kept the name. Last winter was not only nasty and cold, it was expensive. The final bills for winter’s snow plow and street salting came in. Through a Freedom of Information Act request, The Review received a copy of invoices submitted by Platinum Landscaping for snow plowing and street salting during the winter season, and the total cost came to almost $600,000. That was far more than usual, but then again the winter was not only brutally cold, it dumped a record amount of snow, over 93 inches. Platinum, however, only plows and salts about a dozen streets. At one point the company cleared many other streets in the city in an attempt to make them more passable. Some of the money paid to Platinum went for cold patching potholes. Emergency Manager Cathy Square said she did not find the cost alarming because of the amount of snow that fell. “It is what it is. I can’t question that,” she told The Review in April. City Councilmember Robert Zwolak accused the city of charging homeowners twice for garbage pickups. And he asked for the Attorney General’s Office to determine if the city was breaking the law. His claim was based on an action the city council took in 2010, before the emergency manager came to town. Back then, the council wanted to shore up the city’s sanitation tax, which was almost 3 mills. The tax was bringing in $600,000 a year then, but that was $130,000 short of the actual cost of collecting garbage. So, the council agreed to tack on a $3 monthly fee to the water service bills, which was estimated to bring in an extra $250,000 a year. Dickinson East Elementary School went to the dogs. The Watch D.O.G.S. (Dads Of Great Students), to be exact. The national organization was created to get fathers of students more involved with their kids and their school. On a recent afternoon, about 30 dads and granddads came to hear about the program at Dickinson. The program doesn’t demand much. Dads are asked to donate as little as a few minutes to just one day a month at the school, helping out in any number of ways. Program organizers say the presence of fathers helps reduce bullying and the volunteers provide a positive male role model for those students without a father at home. 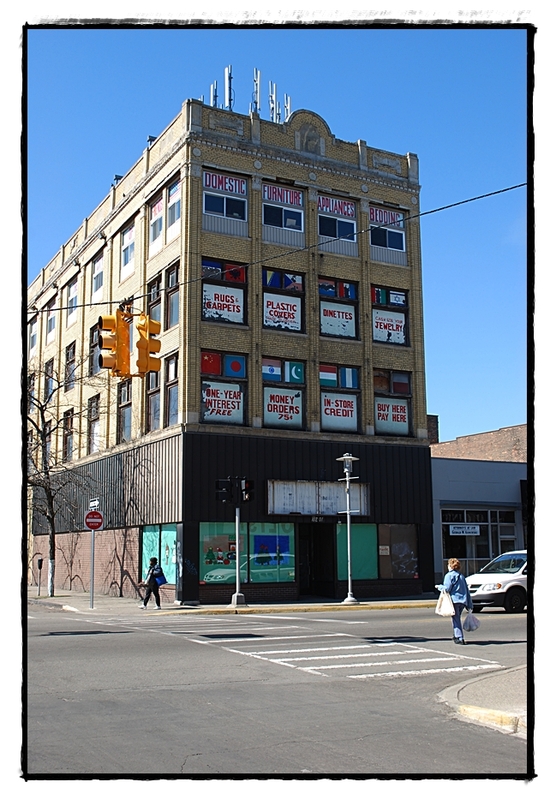 Slowly but surely, Hamtramck city-owned properties were being bought up. The city had been in possession of hundreds of empty lots over the past few decades and had been forced to hang on to them until a housing discrimination lawsuit was settled. With the case finally closed, there were still plenty of lots to dispose of. The city held three auctions, with one auction resulting in 39 lots being sold, netting the city $23,000. Kathy Angerer, the Director of Community & Economic Development, said she did not know whether the lots would be developed. 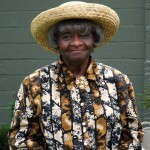 She said, however, most of the lots were purchased by people who lived next-door to them. For 100 years Hamtramck has had cops on hand to keep the public safe. That was before Hamtramck became a city and was just a village. That tradition has lived on and grown over the years. In mid-May, the department celebrated its milestone at the PNA hall with a couple of hundred well-wishers and former members of the department. Hosting the night’s ceremonies was Fox-TV reporter Ron Savage, who had done many Hamtramck news stories in the past. Local elected officials, including Wayne County Executive Robert Ficano, State Sen. Bert Johnson and Wayne County Commissioner Martha Scott, presented proclamations. 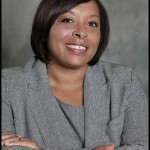 Reflecting on the one-year anniversary, Marva Hairston, Chief Executive Officer of the county’s Jos. Campau center, said the biggest challenge had been the tremendous language barrier. Other obstacles also included cultural ones. Some Middle-Eastern women are not used to all the touching nurses and doctors do during routine check-ups. But staffmembers at the center made big strides in breaking down cultural and language barriers. Hamtramck’s Fourth of July was set to have extra “oohs” and “aahs” this year. Thanks to the Hamtramck Fire Department, the city won a contest to celebrate the holiday with a real fireworks show on July 5, the first in at least 30 years. It looks like after years of asking for one, Hamtramck was on the verge of getting an emergency loan from the state. After much discussion, the city council approved a request by Emergency Manager Cathy Square to apply for a $2 million loan from the state. Square told The Review that she was confident the state would approve the request. The loan was going to be used to shore up its pension system, which is called MERS (the Municipal Employees’ Retirement System). A group of architects pulled out of a deal to purchase the city-owned Jos. Campau-Belmont building, the tallest structure on Jos. Campau. “We just couldn’t come to a final agreement,” said Kathy Angerer, the city’s Director of Community & Economic Development. But there was still good news. 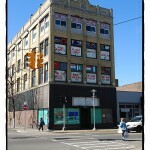 The second highest bidder for the building, Lafayette Lofts, Inc., signed an agreement to buy the four-story building. Angerer said the development company’s bid for the building was $86,500. Development of the building is still pending. Want to know what Hamtramck is like? The school’s ethnic diversity was on full display via artwork, dance and musical performance. The free program featured Albanian, Bosnian, Arabic, Bengali, Hindu and Ethiopian dancers as well as tap and ballet dancers. Some of the native costumes the performers wore were an explosion of bold colors. And there were those who performed dances that were hypnotic. A would-be medical marijuana dispensary operator jumped the gun too soon. On a recent afternoon, Hamtramck police shut down a business called Go Green at 9629 Jos. Campau for operating without a business license and storing medical marijuana in a back room. The business made its first mistake by opening its doors without first getting a business license. The second error was offering marijuana for sale without first getting a license to be a dispensary. One thing led to another, and a person there consented to allow the chief to look in the back room. Garbarino said there were about 20 jars filled with marijuana. The pot was confiscated but no charges were filed. The city has yet to adopt a law regulating the industry. Hamtramck finances were not as rosy as thought. Just a few weeks earlier Emergency Manager Cathy Square said she had a sound budget for this year and next year that even boasted a surplus. But then the city’s pension operator, MERS (Municipal Employees’ Retirement System), had some bad news. Because the city fell behind several months in making payments before Square came here last year, MERS demanded higher yearly payments. Square said that would result in the city falling behind in payments once again by next year. MERS wanted upwards of an additional $5 million over the next five years, Square said. Square eventually got a better deal and averted the city from filing for bankruptcy protection. Hamtramck property owners were on the hook for paying a lawsuit settlement with former City Manager William Cooper. Cooper accused the city of breach of contract after being abruptly fired in March of 2012, three years after being given a new contract. The city agreed to pay Cooper $142,000, said Emergency Manager Cathy Square. The city has already paid Cooper about $20,000, and property owners would have to pay the rest. Cooper had been on the job for nearly four years before a majority on the city council voted to oust him as the city’s financial picture took a turn for the worse. For the past three years, or so, Albert Andrus of Trowbridge St. had been trying to get the city’s attention. He called and filled out complaint forms, but still, the burned out rotting house across the alley from him remained. And it didn’t appear it would be demolished any time soon. In the backyard of 1995 Belmont, there were tall weeds and piles of tossed garbage that produced a stench so bad the neighbors next door couldn’t enjoy their outdoor pool. A political statement from someone ranting about the menace of urban blight? Who knew, but the message from city hall was that until the title of the property is cleared up, there was nothing the city could do. 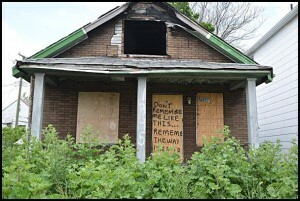 The house still remains, but there is now a blight grant that the city can use to clear up the title and take ownership. That means sometime in the next several months the house will be knocked down. The Whistleblower lawsuit filed by Department of Public Works Director Steve Shaya keept growing. Shaya added two amendments to his original lawsuit filed last April. The initial lawsuit named two police officers, Police Chief Max Garbarino and two former acting city managers. The latest version added two city employees and City Councilmember Andrea Karpinski. Shaya accused a former acting city manager of telling two Public Works employees to falsely implicate him of ordering them to illegally dump debris. He further accused a Water Department employee of initiating the shutoff of water service to a house his sister owns, even though she did not owe the city money. As for Councilmember Karpinski, he claimed that she, while dressed in all black clothing, took photos of his city-issued vehicle while it was parked at his house. Karpinski, Shaya said, took the photos right after he had been accused of a hit-and-run accident involving a retired Detroit police officer. Shaya accused Karpinski of going on his property without permission. The lawsuit has not been settled yet. Hamtramck was on its way to take more direct control of bars and their licensing. The city council considered a new liquor control ordinance that would give city officials more authority in authorizing new liquor licenses and closing down bars that become trouble spots. But Mayor Karen Majewski was concerned that the law could become a political weapon used to retaliate against enemies. But more than that, Majewski said she didn’t want local officials deciding how many licenses should be issued. The proposed law allowed officials to consider the number of bars located near a new bar that wanted to open. If officials decided there were too many bars in one area, the license could be denied. Police Chief Max Garbarino, who compiled the law from other cities, said the law would give him the ability to speed up the process of closing bars that consistently attract trouble. “We need to have the ability to control establishments that become a nuisance in the city,” Garbarino said. Well, that’s it for this week. Come back again next Friday for the second part of our yearly Year in Review.